Of all the countless trophies and plaudits he’s won over the years, it would appear that Andres Iniesta’s grandest prize is still to come. Barcelona are due to play Villarreal in La Liga on Wednesday night and, as a parting gift for Iniesta, the visitors have announced they plan to present him with a very special ornament. Today at Camp Nou, Villarreal will make a guard of honour for Barcelona for the achievement of winning the La Liga title. 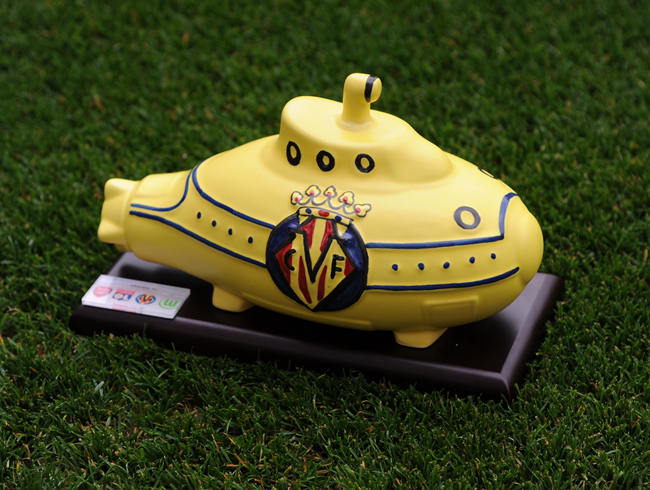 In addition, we will deliver a yellow ceramic submarine to Andres Iniesta as a tribute to his career and the values ​​that he transmits as an athlete. As approved by Ringo Starr himself! Whats with the arsenal, lyon and wolfsburg crests? That’s the version Villarreal gave to Arsenal at the (2015?) Emirates Cup. They’ve handed out a few to worthy recipients. Ah of course! I’ve plumbed new depths of tedium with a clumsy observation like that. No shame in it, my good man! Guard of honour eh? Seems Villareal have more class than Zidan’s mob.